Welcome to the High companies. Please view our brochure to learn more about us. High is a diversified group of privately-held businesses that serves customers throughout the mid-Atlantic and Midwest through the affiliates of two entities. 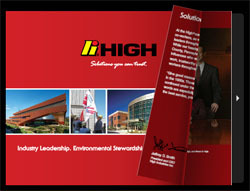 High Real Estate Group LLC includes High Associates Ltd., High Hotels Ltd., and High Environmental Health & Safety Consulting Ltd.
High Industries, Inc. comprises affiliates High Steel Structures LLC, High Concrete Group LLC, High Steel Service Center LLC, High Construction Company, Greenfield Architects Ltd., High Transit LLC, and High Structural Erectors LLC.